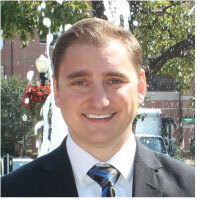 Kevin O’Flaherty is a graduate of the University of Iowa and Chicago-Kent College of Law. He has experience in litigation, estate planning, bankruptcy, real estate, and comprehensive business representation. He regularly teaches seminars on Estate Planning and Business Law. Kevin is committed to giving back to the community both through his work as an attorney and through personal service activities. Last year he served as the Vice President of the Rotary Club of Downers Grove. For the past several years, he has chaired the Business Expo committee for Rotary GroveFest, Downers Grove’s annual summer festival. Kevin was recently appointed to the Board of Directors for Chamber 630, the Chamber of Commerce for the Downers Grove and Woodridge area. This year, he is honored to be a recipient of Suburban Life’s “Best Under 40” Award. In 2016, Kevin received an award from the American Institute of Family Law Attorneys as one of the 10 Best Attorneys for Client Satisfaction for 2016.